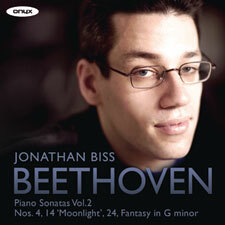 On this second volume in his complete cycle of all 32 of Beethoven’s sonatas, Jonathan Biss has chosen the the early ‘Grand Sonata’ op.7 from 1796 to open the recital. This sonata is exceeded in length and grandeur only by the ‘Hammerklavier’ sonata. He follows this with another early sonata, the famous ‘Moonlight’ Sonata, and the fascinating Fantasy op.77, concluding with one of the composer’s own favourites, the delightful op.78, which may have been intended as a companion work to the Fantasy.